If you’re looking to add a special touch to a garment or accessory that you have crafted, or you want to give a fabric item that you have purchased some extra pizzazz, embroidery is a great option. Embroidery adds intricate detail to virtually anything, including drapery, flannel, fleece, knit fabric, quilting fabric, and even leather and suede; in other words, you can add embroidery to all types of sewing fabric. But, in order to embroider, you need the right tools. A basic sewing machine won’t due; instead, you need a specialized embroidery machine. You also need to have the right type of machine embroidery thread. Whether you’re new to sewing or you’ve been practicing your craft for a while but you want to add a new dimension to the masterpieces that you create, embroidery is a fantastic skill to learn. With a little sewing help, patience, and practice, you can master the art of embroidery. To get you started, here’s a look at what we think are the best thread for embroidery machines that are a must-have addition to your sewing room. Now that you’ve had a sneak peek at our five picks for the best embroider thread and floss, let’s examine each option a little bit closer. Below, we offer a detailed overview of each of these high quality embroidery threat options. We discuss the important features of each thread, what we like about each option, and what fellow sewers who have used the threads have had to say about them. Once you have read through the reviews and have decided which option will best meet your needs, click on the yellow link to find the best prices currently available on Amazon. When it comes to embroidering, you want to make sure that you have an embroidery thread that is as high-quality as the machine. With Simthread 63 Brother Colors Polyester 120d/2 40 Weight Embroidery Machine Thread, you can have confidence knowing that your embroidery work will turn out simply beautiful. This thread is highly versatile, as it is compatible with a wide range of embroidery machines, including Brother, Babylock, Singer, Bernina, and a Janome sewing machine, just to name a few. It’s also one of the best embroidery threads on the market. Since 1990, Simthread has been creating some of the highest quality threads possible. They have dedicated years of research to exploring a new type of yarn, known as Trilobal Polyester Yarn. Not only is the material extremely durable, but it’s also environmentally friendly, which is a major plus. To further add to the benefits of this thread, it offers a lustrous sheen and unbelievably vivid colors. The color of this threat can withstand excessive laundering, and even harsh detergents, including chlorine bleach. The threads do not break, shred, or split, so you can have peace of mind knowing that you won’t have to deal with issues while you’re working. You’ll also have confidence knowing that your handiwork will last a long time. All threads are exhaustively tested to ensure their strength, and they are also certified non-toxic, BPA-free, lead-free, and phthalate-free for the ultimate in safety. This package comes with 63 spools of thread in some of the most popular colors, and each spool offers 550 yards of thread. You also receive a complimentary pre-wound bobbin thread and tear away stabilizer. Final Verdict: If you’re looking for a high quality embroidery machine thread that will work with a wide range of machines, then Simthread 63 Brother Colors Polyester 120d/2 40 Weight Embroidery Machine Threat won’t disappoint. It comes in a variety of popular colors, it’s highly durable, and it offers an incredible sheen. Most users are very pleased with the product. Next up on our list of the best embroidery machine thread is the New Brotheread 63 Brother Colors Polyester Embroidery Machine Thread Kit. Like the above-mentioned kit, this one also comes with 63 spools of thread in every color of the rainbow, from white to black, and from blue to pink. 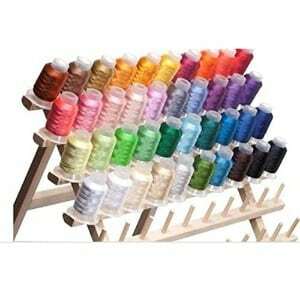 The thread is 40 weight, which is the perfect weight for embroidery work, and each spool contains 550 yards of thread. These threads are made out of durable polyester. They offer exceptional tensile strength, which reduces the risk of fraying, breaking, and unraveling. Furthermore, polyester thread is also famed for its low puckering and looping risk. These threads hold their color extremely well; they have been tested and proven to withstand the harshest chemicals and temperatures, including hot water and chlorine bleach. The threads are also compatible with a wide variety of some of the most popular embroidery machines on the market, so whether you have a Brother, Janome, or Singer sewing machine – or any other popular brand, this thread will work for your embroidery projects. While most users say that they are very pleased with the durability, color selection, length, and weight of these threads, one downside was noted: the kit doesn’t come with a rack or any other accessories. However, considering the quality of the thread and the price, we think this kit is a great deal. If you’re looking for a budget option that will give you more bang for your buck, then you might want to consider this embroider thread from Embroidex. It comes with 40 spools of thread, and each spool offers weight of 40 and 550 yards of thread, just like the other options listed thus far. Also like the other embroidery thread kits above, this thread is made of polyester, which is extremely durable and offers a fantastic tensile strength. You’ll be able to embroider in confidence without having to worry about breaking, fraying, looping, and puckering. Furthermore, each thread offers excellent color fastness, which means that the color won’t run or fade when laundering. It has been tested and proven to withstand high temperatures and harsh chemicals, such as chlorine bleach. 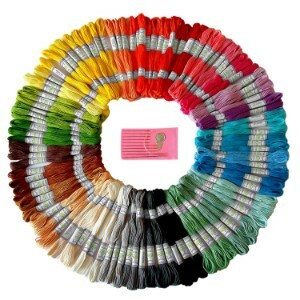 This thread kit comes with 40 different colors, which is the highest amount on our list. Colors range from white to black and everything in between, including red, pink, purple, blue, gray, green, yellow, and so many more. There are also pastel and deep colors, and the colors are so incredibly vivid. These threads are also backed by a 100% risk free satisfaction guarantee; if you aren’t satisfied for any reason, you’ll receive a new product or a refund, no questions asked. While most of the reviews that we read were positive, some customers said that they weren’t entirely pleased with the thread. There were reports that it was a bit hard to work with and that the thread isn’t as durable as it claims to be; however, it’s important to note that this is subjective to a user’s experience and skill level. Final Verdict: If you’re looking for an embroidery thread kit that offers a variety of colors, is durable, and is affordable, than you should be quite pleased with Embroidex 40 Spools Polyester Embroidery Machine Thread. You’ll receive 40 different colors of polyester thread that offers excellent color fastness and has low breakage and fraying; plus, the kit is backed by a satisfaction guarantee. Mira Handcrafts Premium Rainbow Color Embroidery Floss is another fantastic option to consider for your next embroidery project. 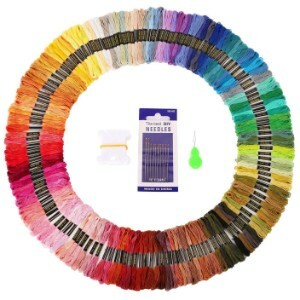 This embroidery floss kit comes with a total of 105 skeins of 100% cotton thread. It’s great for making all types of projects, such as friendship bracelets, thread wrapped earrings or bangle bracelets, necklaces, dream catchers, and so much more! The kit features a total of 35 different colored threads that run the full spectrum of colors, from white to black and virtually every color in between (brown, beige, red, pink, purple, blue, orange, yellow, green, and more!) Each skein offers 8.75 yards of floss, so you’ll have enough to complete whatever project you are working on. Not only do we love the color selection and the amount of thread that this kit comes with, but we are also impressed by the fact that it comes with a complimentary set of needles. It’s the company’s way of saying thanks for doing business with them. To further enhance the experience, this kit is also backed by a 100% satisfaction guarantee, and the company offers 24/7 customer support to answer all of your questions. Based on the reviews that we read, most customers are very happy with this brand of embroidery floss. They are very pleased with the durability of this floss, as well as the color selection. Final Verdict: With Mira Handcrafts Premium Rainbow Color Embroidery Floss, you will be able to create just about any craft that you want to make. We love that it comes with so many skeins of floss, and that there are so many different color options. Last, but definitely not least, on our list of the best embroidery thread and floss is this kit from Soledi. It comes with 150 skeins of high-quality embroidery floss that you can use to make virtually any type of project. Use the floss to create beautiful dream catchers, bracelets, anklets, earrings, key chains, headbands, or anything else that you can think of. The floss is made of a blend of polyester and cotton, so it’s exceptionally durable and very flexible. 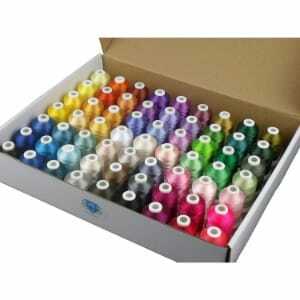 You’ll receive a full spectrum of colors with this package of embroider floss. Colors include black, white, gray, brown, yellow, orange, purple, pink, blue, red, and so many other hues. There are pastel and vibrant colors, too! Each of the 150 skeins offered in this package contains 6 strands and 8 meters of floss. The package also comes with 10 embroidery needles, 12 floss ribbons, and a threading needle as free gifts. Backed by a 100% satisfaction guarantee, if you aren’t happy for any reason, contact the company and they will refund your money or offer you a new kit. Final Verdict: No matter what type of embroidery project you are working on, you’ll be able to craft beautiful creations with Soledi Embroidery Floss 150 skeins. It comes with a full spectrum of colors and the material is highly durable. Whether you’re a seamstress or you enjoy making hand-made crafts, embroidery thread and floss is a fantastic option to have in your crafting toolbox. There are literally dozens of embroidery thread and floss options on the market, however, which can make it difficult to choose the best option. But what’s the difference between embroidery floss and thread? How did we narrow down the choices to just five options? What type factors should you consider when you are shopping for floss or thread for your embroidery projects? In this section of our review, we’ll answer these questions and more so that you can make the best choice for your individual needs. 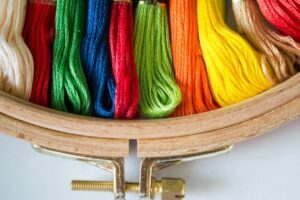 Embroidery Floss and Thread: What’s the Difference? Both are threads that are used to create a variety of different crafts, and of course, embroidery work. There are differences between these threads, however. For example, embroidery thread is made of a twisted-like material, while floss is made up of six different strands that can be separated. Floss is also thicker than thread, which means that it is more durable and usually more expensive; however, it cannot be used for creating embroidery on fabrics. For that type of project, you will need to use thread. But, because embroidery floss is thicker and more durable than floss, it can be used to create a variety of crafts, such as key chains, jewelry, dream catchers, headbands, cross stitching, and so many other things. In order to narrow down the options of the endless array of embroider thread and floss options that are out there, we enlisted the help of experts. We called in a panel of seamstresses, professional crafters, and self-proclaimed sewing and crafting enthusiasts. We asked our panel to help use go through all the different options to determine which floss and thread was the most durable and offered the best results. We also read through countless reviews from customers that fellow sewers and crafters have shared. 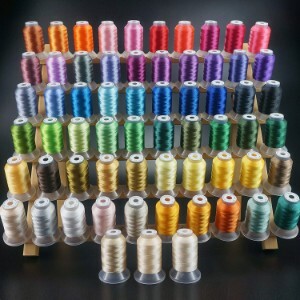 Based on the insight that our panel of experts provided us with, combined with the information that we obtained via the reviews, we were able to come up with a list of what we consider to be the top five embroidery threads and flosses. While the options we have listed in our review are some of the best on the market, if you do decide to look for another option, it’s important to know what type of factors you should take into consideration so you can choose a high quality product. What type of project are you going to be working on? Will you be sewing embroidery into fabric, or will you be creating a bracelet, for example. If the former, you will need thread, and if the former, you will require floss. You’ll want a durable floss or thread. Ideally, it should be made of cotton, polyester, or a blend of the two materials, as these materials offer very high tensile strength. Color fastness. This is important because you don’t want the color of the thread or floss to bleed or fade. Look for options that have been tested for their color fastness. The best options will be able to withstand regular laundering, high temperatures, and harsh chemicals, such as chlorine bleach. Of course, you should also consider your budget. Like all things, the cost of embroidery floss and thread can vary widely. You can get some high quality products for an affordable price if you do your research. Embroidery is a wonderful form of crafting to get into. It truly is an art and it can be used to create so many beautiful things. Whether you are planning on adding embroidery to a jacket, pants, shirt, handbag, or any other type of fabric, or you want to create a handmade craft, such as a friendship bracelet or anklet, you’re going to want to have high quality, durable, and colorful embroidery thread and floss in your toolbox, along with other essential sewing tools. Each of the five threads and flosses listed in our review are the highest quality on the market. If you choose one of these options, you can be sure that you will be getting an outstanding product that will deliver outstanding results. However, if you are shopping for something else, make sure you do your due diligence by researching and considering your needs before you select an option.